First of all, this clearing/meadow/back yard tewtelly looks like a Ranger Rick poster, like there should be a caption at the bottom that says "Working Together!" on it. The kind of poster on the wall in third grade. Radical! 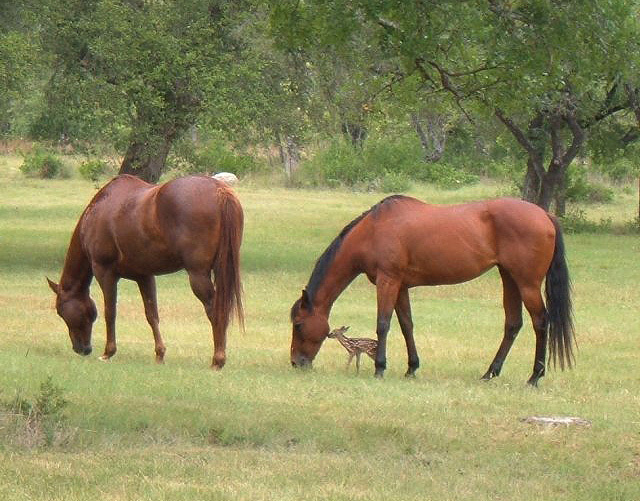 You know that horse is all "git out the way" and the fawn is all "I shall mimic your grazing pattern!" I think I'm cruisin' for a C.O. coma...Amy M., call the DOCTAH! "the fawn is all 'I shall mimic your grazing pattern!'" Bambi-ette is all like, "Man, I am hangin' with these dudes, they're like the Shaqs of the deer world!" Geez louise, it's not even as big as that horse's head!!! I swear... I always know EXACTLY what voice you mean for the little critters, even when you don't specify. "Git... out the way", all doleful and hickish horse. And "I shall mimic your grazing pattern!" is clearly Ralph Wiggum's voice. and i heart ranger rick. where's mom indeed? Bambi looks like s/he went up to the horses because s/he confused them for mom. 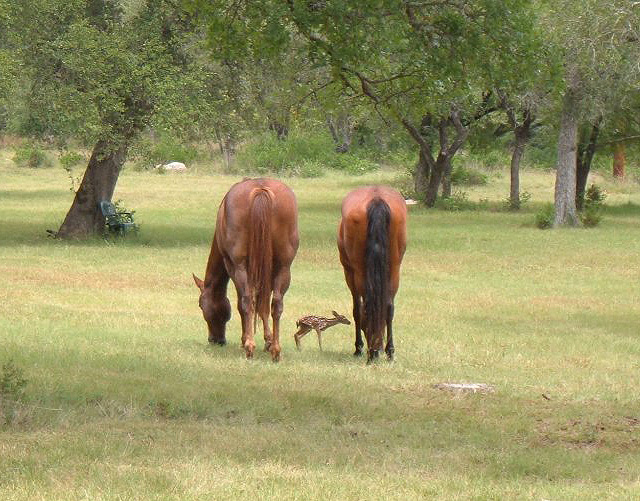 Aw, the last pic it looks like horseh is being very motherly and protective of lil Bambeh. Like, you stick with me, babe, with your knobbely knees. GAAAAH so cute, my tummy fell outta my office chair. Oh this so made up for the hamporn. I feel clean again. I've seen this series before and the fawn's mom is just offscreen. If I remember it correctly, the fawn and mom grazed with the horses everyday. No one is lost and no fawns were harmed in the making of these photogs. Hi, ariel--nice to see you again! You wanna know where Mom's at?! Wow. I have now COverloaded. I seriously think this is the cutest thing ever posted. I'm going to need that doctor, too. Thanks, Kris. I was wondering what happened to the doe; i feared the little dude was orphaned. I'm glad he's just enjoying haning out with the cool crowd! Since this is a girl horse, I think she's thinking: "Dang, I wisht mine came out this small. That wouldn't hardly be any work at all." Such a wunnerfuls wittle bebe. Does anyone else see the big white rabbit in in the bushes in the background? Or shall I just call him Harvey? Okay, that did it...I'm cute overloaded. My head is swelling, it's rolling from side to side, it tumbled onto the floor! What a precious little baby and what nice whinnies! Great pics! We sure can see the spot pattern on that baby! Is it a boy or girl, AmyH??? "I've seen this series before and the fawn's mom is just offscreen. If I remember it correctly, the fawn and mom grazed with the horses everyday. No one is lost and no fawns were harmed in the making of these photogs." Stone rolled off my heart; I thought the little one had lost his momma. I hope it goes back to it's mommy soon! She's probably kind of confused by the situation! Like she looks everywhere for her kid, only to find him/her with the horses next door. "I don't know why you insist on hanging out with those HORSES! They're just TROUBLE! Do you hear me? Don't you EVER wander out of my sight again!" i also made an appearance as the siren on pirate day. Glau-fawna - a debilitating eye condition found in bebeh fawns; symptoms include a specific type of near-sightedness leading to examples of inter-species grazing. So adorable! Thank you to Kris for reassuring us about mommy deer, now I can enjoy the cuteness 100 percent! Could your commentary play-by-play on these pictures be ANY funnier, madam? I think we need to get together for BLTs and snarky conversation. Love you! ...is all "I shall mimic your grazing pattern!" sounds like something Jack Black would say. Yup, that looks like Texas Hill Country, right down to the live oak and elm trees in the background. Gorgeous equines, too! AH! Awww, frank you for posting some ponies, Meg! That's tewtally what I needed today. Someone in one of my online equine groups posted this series a while back. I'd almost forgotten about it! EEE! Now that you mention it, it reminds me of my uncle's (former) ranch near Houston. Pecan trees & horses they had. Only time I ever saw an armadillo (well, a live one) while I was living in TX. Teeeeny fawn, or really big ponies? So sweeeeeeeeet!!! Itty bitty fawn and really dang big horses! I'm not usually one to scream the PS word... but soemthing about the proportions here looks off. 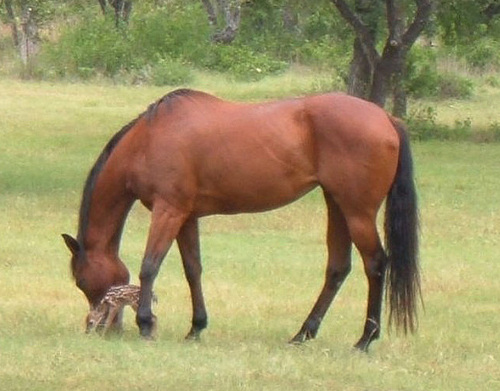 I'm around horses every day; we often see deer and their fawns grazing nearby. Something in that last shot isn't right.. I'm just saying, is all. But hey, if it makes you go awwwww, no harm. (*Runs away to escape the torches and pitchforks). Teeeeny tiny fawn and horsies all "whatever"! Eeee! I'll put in another vote for gotta-be-the-Hill-Countreeee. Sounds good to me, mariser! Those bebes are sooo tiny!